Whether you’re managing diabetes, want to lose weight, or just plain want to be fit while eating insanely scrumptious meals, weight-loss expert Devin Alexander is here to assure you, “You Can Have It!” The celebrity chef on the hit series The Biggest Loser and the author of the New York Times bestselling The Biggest Loser Cookbook series and The Most Decadent Diet Ever!, Devin Alexander has created a collection of easy, diabetes-friendly recipes that seem simply too good—and too decadent—to be healthy. I've cracked the code for how to make decadent recipes that are actually approved by doctors, dietitians,and now the American Diabetes Association! These recipes are not the "diet food" I tried to eat when I first knew I needed to make a lifestyle change. These are recipes that I actually look forward to making and eating! And I know you will too! Using her chef secrets, tips, and techniques that helped contestants on the show lose weight and wowed customers in her restaurants, Devin has crafted easy, diabetes-friendly recipes that bust the myth that eating well means giving up the comfort foods you love. YOU CAN HAVE IT! : More Than 125 Decadent Diabetes-Friendly Recipes includes beautiful photographs, easy-to-follow tips and techniques, affordable ingredients, and mouthwatering meals; this is the cookbook every person who cares about their health (whether they have diabetes or not!) will want to own. YOU CAN HAVE IT! : More Than 125 Decadent Diabetes-Friendly Recipes runs the gamut from savory snacks to delicious desserts with more than 125 recipes that celebrate pizza, burgers, and rich chocolate pudding—and help those who have diabetes live richer, fuller, more delicious lives. Whether you're managing diabetes, heart health, or trying to lose weight, no meal is "off limits" and no favorite is forbidden. With small tweaks and the right approach, Devin is here to tell you: You Can Have It! 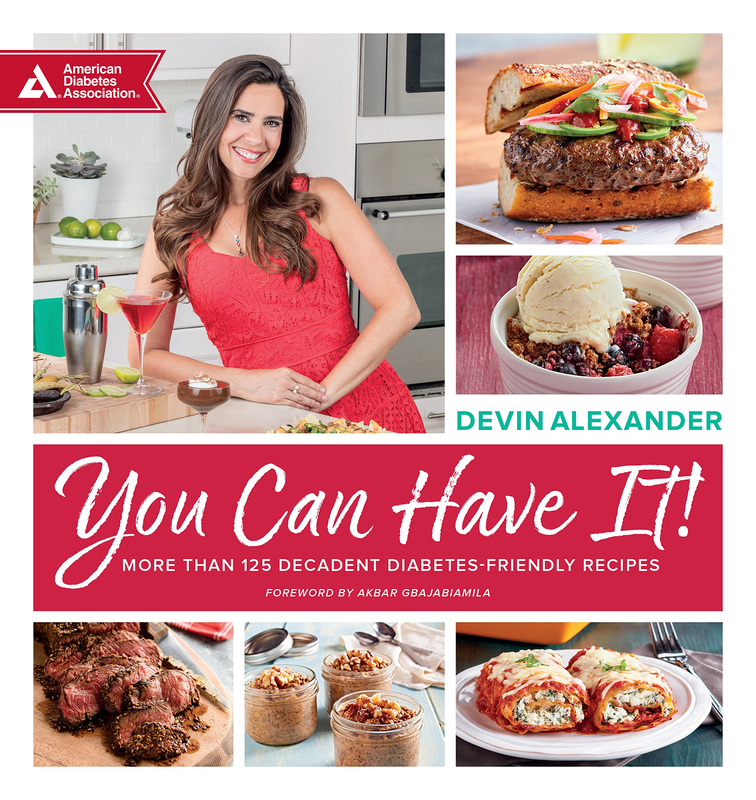 DEVIN ALEXANDER is a media personality, healthy comfort food chef, weight loss expert, and New York Times bestselling author. She was the chef of NBC’s The Biggest Loser and the author of 9 cookbooks including The Biggest Looser Cookbook series and The Most Decadent Diet Ever. Devin’s unique approach to healthy cooking and her motivational personal story have landed her regular appearances on talk, news, and weight loss and fitness shows for over a decade, making her America’s go-to expert for decadence without consequence. Devin has shared her secrets through frequent appearances on The Today Show, Good Morning America, The Biggest Loser, Dr. Oz, Dr. Phil, The View, FOX, CNN, and others, and through over 500 magazine features including those in Prevention, Men’s Health, and Shape. She’s coached thousands of pounds off others and has maintained her own 70-pound weight loss for close to 30 years. Devin truly lives and eats her message: you don’t have to deprive yourself to be fit and healthy. I had the chance to test out a few recipes from this book. The lasagna roll-ups were a huge hit, and while nothing was a hue "miss" the pomegranate pork didn't pack the flavour punch I expected with such expensive ingredients. By for the best recipe in my household's opinion was the Thai Lime Quinoa Salad - bright and fresh, making it perfect for Summer. To make the meal more complete (since quinoa isn't really that rich in protein), I added a block of baked marinated tofu to the mix. It packs well for lunches or picnics and never gets soggy like greens can - I highly recommend dressing it warm so the quinoa can soak up the dressing. My main complaint with this book was the lack of dessert or sweet options. The diabetics in my family have unabashed sweet teeth, and I was hoping this book would provide some ideas as to how to satisfy them while keeping their health in check. Unfortunately, most of the options were "immediate consumption only", and I was not able to logistically try them in my ever-mobile family.